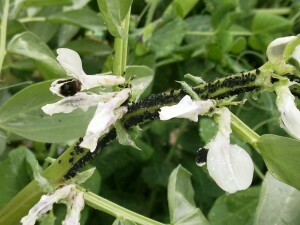 Blackfly has arrived on the outdoor broad beans. In typical fashion, there was no sign of them until, seemingly overnight, the hoards moved in and covered the top six inches or more of stem. Their arrival should not, however, cause a rush to spray with any nasty stuff as they are readily dealt with using simple organic methods. Although commonly referred to as blackfly, this pest is not a fly but an aphid, more properly known as black bean aphid, Aphis fabae. In times past, aphids of all sorts, and other similar pests, were referred to as blight, not to be confused with the various plant diseases that are now known as blights, such as the fungus like late potato blight. The term may still be heard from time to time today. Blights are of all colours, but green is their most fashionable hue; those of broad-beans are black as soot, and velvety, — and these, if attended to, do but little harm; they cluster at the very top, and each bean should be topped just below the blight, and the top carried away and burnt, — not thrown on the ground, — or else they are sure to climb up the bean-stalks again, and, stopping here and there at the best landing-place, increase and multiply, and soon cover the whole plant; nor should they be buried in the ground, for they take care to outwit you by living underground for months, and when the gardener’s spade turns them up again, they make for the beans directly: the plan of topping the beans does not injure the crop, but, if carefully done, rather improves it. Provided sufficient growth has been made, the removal of the tips is a good idea. Otherwise, their numbers can be readily controlled by a gentle squish of the fingers or by blasting them off the plants with a jet of water. I opted for the latter, as the hose was close by; this is usually sufficient, but will probably need to be carried out several times. Soap based sprays can be used to safely kill the aphids, but these will also kill anything else that happens to be around at the time, and some plants are sensitive to insecticidal soap. I prefer to just jet them off the plants. We do have a large population of ladybirds most years, and these will multiply in numbers and predate the aphids in due course. It is, then, a matter of controlling their numbers until a satisfactory balance is struck with their predators. Sprays based on garlic are also said to be good deterrents, as the sulphur in the garlic is toxic to various pests. I did experiment with such sprays one year, but was not impressed with the results. That hardly constitutes scientific evidence, so I may try them again sometime. Planting nasturtiums as a sacrificial crop is also said to be useful, as aphids supposedly attack them in preference to beans. We had a great many nasturtiums growing last year, but I did not see a single aphid on them. We did, however, find aphids on our broad beans, and to a lesser degree, on some runner beans. We even have some self seeded nasturtiums growing near the broad beans this year, again without a single aphid. Perhaps it helps under different circumstances, but this is not something that I plan on trying again in the future as they set seed so freely they can become something of a nuisance. In fact, I have some problem with the entire notion of sacrificial planting, as it would seem sensible to me to minimise the quantity of attractive host material. I do not particularly want aphids on my broad beans, but neither do I want large colonies breeding unchecked on nearby nastrutiums either, as I imagine they would then readily spread to other plants. 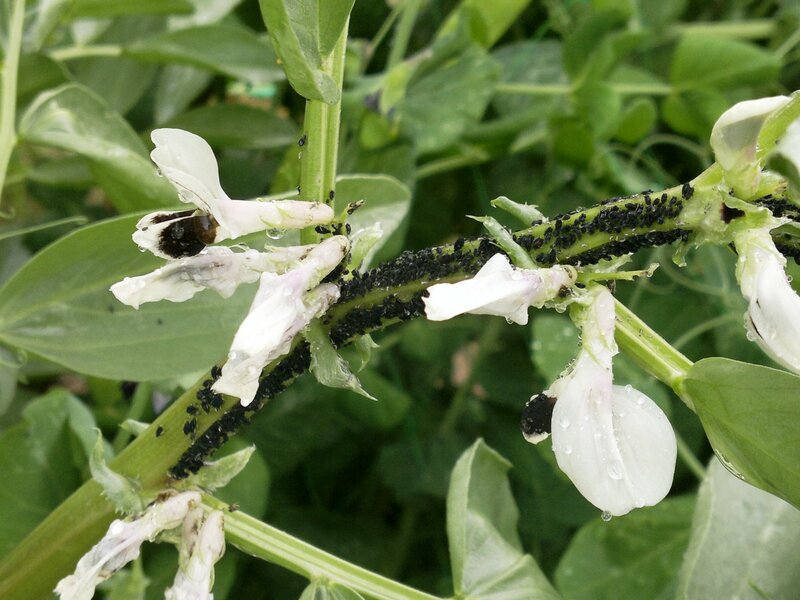 This entry was posted in Garden diary and tagged aphids, beans, pests on June 21, 2013 by JV.